He became the sixth Indian bowler to take five wicket on debut. Other five are M Nisar, VV Kumar, S Abid Ali, DR Doshi and ND Hirwani. Well done Mishra and congrats a lot. I hope that this not only a one match fluke but he will also continue delivering wonderful performances in future. 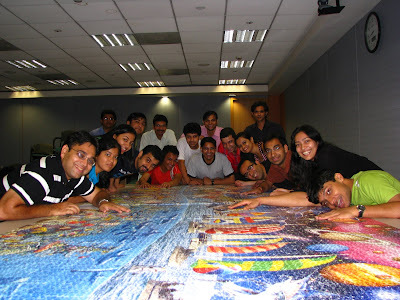 Disclaimer: This post is about the world record set by 18 JIGSAW ENTHUSIASTS at Adobe India. This is going to be a very long post so please make sure that you have a enough time to read it. I want to pay special thanks to SAI as most of the below write-up is a part of the write-up, SAI has written for Adobe India intranet top story. 18 ENGINEERS, 24000 PIECES AND 108 HOURS, this is all needed to set a world record. 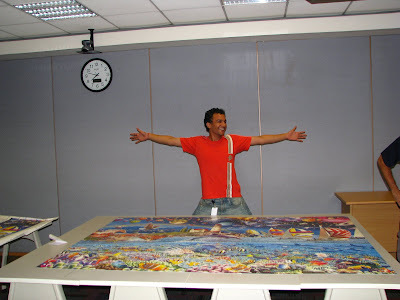 Oops, not just one world record but 3 records actually: (i) First in India to solve world’s largest Jigsaw Puzzle (ii) First in world to do it non-stop (iii) First in world to solve all 1k, 2k, 3k, 4k, 24k pieces puzzle by Royce McClure. 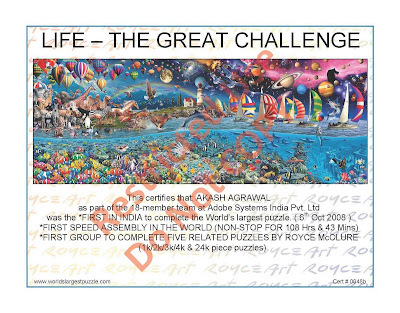 As indicated by my earlier post on this topic, most of the regular readers must be well aware of the fact that a team from Adobe India is going to attempt world’s largest puzzle-LIFE first time in India. 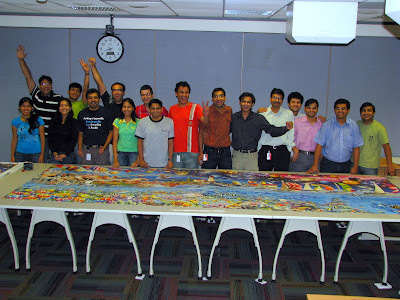 The puzzle was a monster by all standards – it had 24,000 pieces and was therefore the official Guinness World Record holder for the largest jigsaw puzzle title, weighed 12 kg and measured 14’x5’ when done. Worldwide only about 30 successful attempts had been made on it before ours. Since we had a holiday on 2nd October and 4-5 being a weekend, we decided to take personal-time-off from office on 3rd and had an extended weekend of 4 days (2-3-4-5) to solve the puzzle. Actually the intention was if we fail, we would utilize the next long weekend (9-10-11-12 Oct) to finish that. Finally the D-day came and 18 jigsaw enthusiasts were all set to add a feather in their caps. October 1st, 2008, 7:00PM. The team assembled in Amazon (Adobe conference room), which was reserved for the puzzle. Anxiety, enthusiasm, passion, determination and a positive vibe started to fill the room. It was a divine feeling to be present in that room. It was an indication of something big coming up. Everyone’s heart was beating faster than normal. Silence mixed with motivation prevailed among the people in the team. Soon, a lot of people from all over Adobe came over to wish us the best. Now, the team was loaded with a lot of expectations from their friends and colleagues. It was no more a play or a fun-event. Now, this was serious. The team knew what was in store, and also did not know what was in store. A huge uncertainty beckoned the team. As per the Limca-Book’s guidelines, two witnesses came to ensure that the pieces were packed as purchased and no marking of any sort is present. Our witnesses were a retd Colonel and President of Rotary Club, Noida. That set the ball rolling. The first set of pieces was let loose from its packet, and it filled a set of three tables. We were overwhelmed with the number of pieces. But thanks to 2 months of hard work and practice on different size of puzzles, this was something that we expected. Immediately, we knew what we needed to do. Pieces for the following prominent objects were identified and bucketized – Balloons, Animals, Sea Water, Underwater, Clownfish & Coral Reef. Gradually folks started moving over to other tables, in pairs or solo, and started working on these objects or assembling the edges. The weight of expectation was easily forgotten among the wisecracks and quips coming from all members of the team. People played various genres of music, the variety being so vast that sometimes the changeover was actually amusing. Quickly, many balloons and animals started taking shape, the most prominent being Zebra, Giraffe and Elephant. Within few hours progress was visible. The previous day being a working day, the fatigue now started setting in. Some of us left to catch a short nap and to come back with rejuvenation. The people who went to sleep could not sleep properly and were awaken by their passion for the puzzle. In around four hours, they were back to the room and joined the rest of the team, while a few more went for sleep. This shift-based rest continued all through the four days, with around 15 people in the day and 8-9 people during the nights. The passion for the puzzle killed many people’s sleep, and people simply wanted to give their best to “Life”. End of day one started seeing the first section close to completion, and required only a few hands. Most of the people moved over to the next section. Two sections started building up in parallel and by the morning of 3rd October, the first section was complete. It was a time to rejoice. We were a happy lot and congratulated each other, still being cautious about the task in hand. The playlists changed on the music system. It was more inspiring to see the first section complete and ready. The team realized that the second section was a replica of the first in terms of the shapes. Soon, we started overlaying the second section over the first one, and started working on that. This was very helpful and by the next evening, the third packet was opened up for sorting. The second puzzle was done in lesser time, but still it was Saturday morning. By now, fatigue was setting in, and only passion kept a lot of people awake. The third section was a lot tougher than the first two. It was increasingly difficult to work on the pieces. This was the first time; it ever occurred that we might move into Monday, during work hours. Fatigue also caused the strength to decrease. But, the determination and passion brought everyone back, once the third section was complete. In our research about the puzzle, people who have solved the puzzle earlier had quoted the fourth section to be the toughest. And so it was. But, by now, the team had become a set of experts. The willingness increased, and the flow of emotions started. We knew that we were very close to hitting the home run and that gave us the required boost. Lo and behold, the fourth section started appearing much simpler. We knew that we had overpowered the puzzle. Suddenly, everyone was wide awake. No one wanted to leave the puzzle to go for a nap. It was an experience to live and not for literary description. The big moment was not far off. It was Sunday night and we suddenly realized that we were in top gear, and anytime around 10 or 11 in the morning we should be celebrating. We had pulled in the estimate, as opposed to the stage where we thought it might go anywhere towards Monday evening. This was enough for the team to slog it out. An aroma of happiness filled the room. Now the team was together for four long days and nights, and a strong emotional bond was forming. The team comprised of people right out of college and those who had been in the industry for around ten years. There were both men and women. We had Devs, QEs and Managers in the team. But, inside the room, it was a single family. “Life” was the bond that we shared. Everyone was looking at the same direction. Everyone had the same goal. We were all one. Everyone knew that he/she wanted to be a part of it, till the last piece was placed, and kept working towards that. Everyone also knew that his/her presence was required to take it to the destination. Just around 7 AM on Monday morning, we knew that it was about to come. Ecstasy prevailed. We were close to the end. It was a matter of time before the last piece was placed. At Quarter to Eight, the final piece was placed. A sense of accomplishment and success that had never been, was to be seen there. Our colleagues started pouring in. Congratulations from them were well-received. But, it was a sense of joy that the team had and celebrated for close to two hours sitting inside the room, staring at the puzzle. It was an unseen experience. It was befitting our efforts over the 108 hours. It was indeed divine. People in team forgot to call their loved ones to inform them about this achievement, as they were emotionally attached to the achievement. It was disbelief and a feeling that none of the dictionaries support. During the period of these four days, 18 people had just one aim, they forgot the world outside Jigsaw, most of them didn't see daylight during these 4 days, they cracked jokes on each other, they made new friends, they showed their dedication, their energy and their commitment. Some of them were not well since last few days, some of them were in the recovery from elongated illness, sometimes AC was not working, sometimes water was not available, all were tired a lot, everybody had sleepy eyes but these hurdles didn't have an effect on their common goal. When we started, we never thought the upcoming strategies which we discovered during the event. For example, for the hardest section of the puzzle (4th section), we categorized the pieces on under water city in 46 categories and all those categories were based in the shape of pieces. Truly speaking, this technique helped us to finish the hardest section in minimum time. We discovered some new names like "CHOCHILAY", some new scales for measuring 37 and 27 pieces and many other things. At the start, we didn't expect so much media attention but to our surprise a lot of media came in to cover the event. At one end, they were wasting our time but on another end they provided us enthusiasm and motivation to reach the goal. We were overwhelmed when a news channel covered us live for one hour. These things surely ate a lot of time but at the same time they added up in motivation. Here much more can be written about practice puzzles, our dry run over previous weekend, me having high fever after dry run and much more. But keeping the length of the post in mind, I'm skipping all that. Congratulations and record achievements followed. Limca Book of Records, which is the most reputed Record Book in India, will now feature this feat. Now, we are on the Hall of Fame at www.worldslargestpuzzle.com. We are the first group to complete this puzzle in India. We are the first group to attempt this puzzle, non-stop, all over the world. We are the first group to solve 1000, 2000, 3000, 4000 and 24,000 pieces of Life puzzle. The light that entered through the window was now bright and shining. “Life was created.” We have lived “Life” and enjoyed every moment of it. It was an unparalleled experience and these words here cannot do justice. 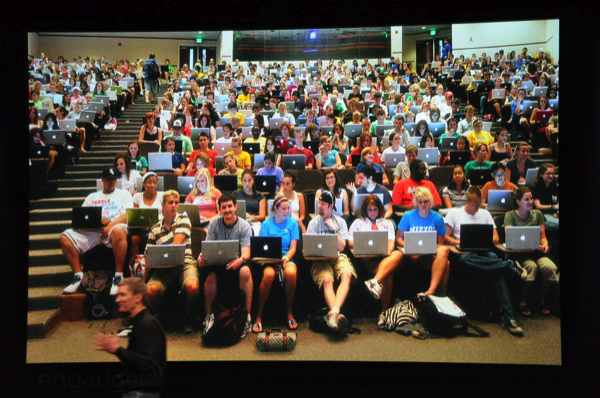 The picture was shown at the recent "Apple Notebook" event at Apple HQ. They claimed that everybody here in this classroom is using a Mac but didn't mention the name of university. For live coverage having time-stamp please click here.